This formidable beast will add presence to your walls while adding a touch of exotic charm that is sure to be noticed! 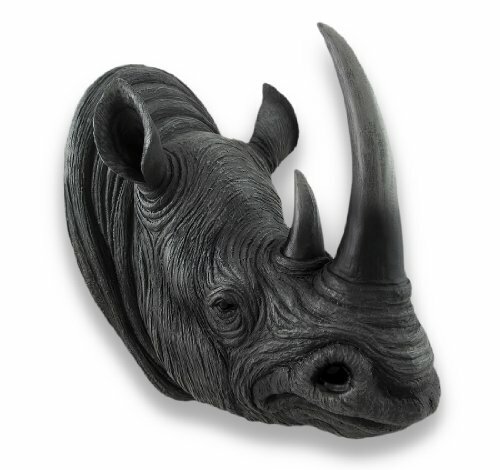 This wall mounted rhinoceros head is a great addition to your trophy collection, or a great way to start one! Crafted from resin, this magnificent horned animal statue is 15 inches (38 cm) high, 8 3/4 inches (22 cm) wide and extends a full 11 3/4 inches (30 cm) from the wall and easily hangs using a single nail or screw via the attached keyhole hanger on the back. This realistically hand-painted gray rhinoceros head statue boasts an 8 1/4 inch (21 cm) horn and realistic eyes perfect for hanging in a `man cave`, to grace the walls of a family room, watch over the room from above a mantel, or greet your guests on the patio. This handsome wall mount can be enjoyed indoors or out allowing plenty of options to find the `perfect` spot, and makes a fantastic gift for collectors or those that are hard to buy for! If you have any questions about this product by Things2Die4, contact us by completing and submitting the form below. If you are looking for a specif part number, please include it with your message.